iTunes Radio Isn't For You. It's For Apple. iTunes Radio is years in the making, and today, it finally lands on millions of devices via iOS 7 and the newly updated iTunes 11.1. Like anything that has been predicted and anticipated for ages, intrigued users will dive in, and in all likelihood, millions upon millions of them will become regular users. They shouldn't, though. Because iTunes isn't for them. Far from an entirely new service that Apple created, iTunes Radio is just a decade-old product baked into a media player that hasn't added a noticeable feature since iTunes Match in 2011—and its last interesting addition was probably Genius in iTunes 8 way back in 2008. iTunes Radio isn't here to change how we listen to music. It's here to make Apple a boatload of money. Like its daddy, iTunes Music is boring, and packed with shortcomings and missed opportunities all of which can be traced back to the simple fact that iTunes isn't made for users any more. And that's a shame, because it should by all rights be the very best streaming service there is. On the surface, it's easy to look at iTunes Radio simply as Apple's extremely belated entrance to the fray. Since Pandora launched in 2005, dozens of competing products have cropped up, but the core artist-based radio feature works pretty much the same way every time. Apple simply copied it: Punch in the name of an artist, and iTunes Radio will be your DJ, playing music similar to what you like. Over time as you star/ban songs, the radio will learn your specific tastes. Every now and then, you'll hear and ad, which theoretically pays for the free music you're listening to. Or for the relatively cheap price of a $25 iTunes Match subscription, the ads disappear. Simple. Like other playlist generators, iTunes Radio offers a degree of tweakability, including the option to build a station from multiple artists, and a variety slider that dictates whether you'd like to hear just the hits, or if you're in the mood to learn about new music. For the first time in its history, iTunes has meaningfully embraced social sharing (let's all just agree that Ping never happened) directly from iTunes with a "Share Station" that lets you easily blast your latest jam to Twitter from any screen; no more navigating to the iTunes Store just to tweet. It's not a stream of what your friends listen to, but it's a start. As far as features go, the only significant difference between iTunes Radio and the rest of an increasingly crowded field is that every song that's playing comes with Buy link so that you can purchase a song and download it to your computer. Which is telling. As with all iTunes purchases, you'll be able to download over and over from iCloud for eternity. 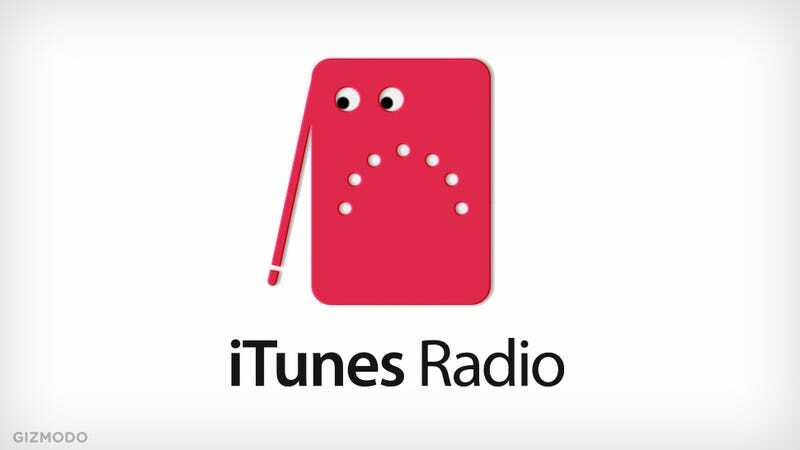 So far, we haven't described anything special here, but there are a lot of reasons iTunes Radio might succeed in capturing a huge user base anyway. Apple did a lot right. First of all, the mobile version in iOS 7 is beautiful and dead simple to use. It's Juicy Fruit for the eyes. And beyond just the interface, iTunes Radio will almost certainly be an improvement on its closest competitor, Pandora, on sheer volume alone. Pandora's 70-odd million users have access to approximately one million tracks, which is nothing when you consider that Spotify and Rdio both boast "more than 20 million songs" and iTunes Radio reportedly has a solid 27 million tracks at its disposal. What's more, Apple's trove of data about music listening habits and libraries (thanks Genius!) makes Pandora's Music Genome Project look like a cutesy computer science homework assignment. Apple's got the data to make a really good radio product. And they've leveraged it into something that's entirely competent. My experience using the iTunes Music beta matches the anecdotal experience of others who report that iTunes Radio is better than Pandora—if only because there is less repetition. For its very limited functionality, iTunes Radio is very good at what it does. But if iTunes Radio wins, it's going to be because it's baked into iTunes and iOS. By the end of the week, iTunes Radio is going to appear on the phones and computers of millions of people as a consequence of a larger software update. Consider that iTunes already has more than 500 million registered users who can now just listen to radio when they want to. You don't need to download Pandora or Spotify, or sign up for a new account. We're lazy. It'll work. So iTunes Radio will be a winner by volume and by default, not because of any features or deals that have forced the music industry to evolve and improve its models. That's disappointing to say the least considering Apple had the Genius data, the corporate power, the financial leverage, the user base, and the design talent to make magical and revolutionary happen all over again. It could have changed the way we listen to music. Instead, it selfishly—and logically—chose to change hardly anything at all. As far as a content hub goes, iTunes is an inferior shrug of a product. Ask yourself what iTunes has that nobody else does better. With the exception of current-season TV episodes and some exclusive content, there's no reason to spend your money there. It's probably the worst thing Apple makes. And iTunes Radio does nothing to unshitty it. Last year, immediately after iTunes 11 dropped, it was immediately apparent that while Apple had beautified and added some performance improvements, it hadn't modernized what the media player could actually do. If you're using the various other means for getting music and movies out there as a standard,iTunes has loads of features that are glaringly, maddeningly absent—Even with the addition of streaming radio and some better sharing integration in iTunes 11.1, the product is hardly progressing. But Apple hasn't addressed iTunes' underlying shortcoming: You're basically restricted to local playback. iTunes Match is still missing a web player for all the music you've blasted to iCloud, and as a product made for music fans in 2013, that's a fatal flaw. We finally have access to the infinite music collection, but the caveat is that we need a device large enough to store it all. Apple was right to invest a lot of energy in making a mobile product, but its overall content ecosystem is fundamentally immobile. Intuitively, it seems ridiculous that for all its cloud integration through iTunes Match, I'm expected to listen to music is with local files through a native client. Honestly, what the hell? How hard would it be to build a web player for iTunes? That's how we watch movies, it's how we store images, it's where we store our correspondence and work documents. Hell, we even store our friendships online. Google Music lets you upload and stream your jams, why won't iTunes? Needing gigs upon gigs of storage to use a product is a tedious anachronism. But even if streaming is great for you, it undermines the core of iTunes' business model. Whereas services like Spotify and the rest are primarily trying to sell you a still-questionably-profitable content service, iTunes is still focused on selling you the content itself in downloadable form. It's basically a huge mall for media. The mall's not cool, but that doesn't mean a lot of people don't go there. The model has been enormously lucrative for Apple and its record label partners, and for this reason, Apple has no reason to evolve its product. Apple's never going to compromise the store—not for any user experience in the world. It's a money-making empire that's keeping the recording industry afloat. Last year, digital download stores like iTunes accounted for 70-percent of recorded music revenue, and of that chunk, one estimate puts iTunes' portion of the pie at 63-percent. Combining those figures is bad statistics, but it gives you a sense for iTunes' monolithic status. Figure 40-percent of the music industry's revenue comes solely from iTunes. Or even 33 percent. It's a huge number. So if it wasn't clear enough before, iTunes Radio is just another path to the iTunes Store. Sure, there are a advertisements and even playlists sponsored by Pepsi. These revenue streams are experiments compared to Apple's time-proven model of making billions, one $1.29 download at a time. Pining for Apple to do something radical when it has absolutely no reason to is ridiculous. It's a mistake to confuse the company's aesthetic humanism and rhetoric with, you know, actual humanism. Apple's in the business of making money, and that's what it's going to do. A decade ago, iTunes was the most innovative product the music industry had ever seen, but today it's a pillar of the industry. That Apple's just adopting streaming music in its decade-old Pandora form should tell you a lot. Until iTunes 11.1, this is what radio looked like in iTunes. Not a joke, that monstrosity was in an Apple product until today. iTunes is moving at a snail's pace, which is too bad because in a few short years, competing streaming services have built up some great products. Spotify's recent social discovery features are redefining how we learn about music, Rdio's exploring the possibilities of exclusive content, Google Music built a super-efficient on-demand interface, Songza's trying to pinpoint user moods, Slacker Radio employs actual humans to build wonderful playlists, and Xbox Music is trying to figure out a minimalist interface for your TV screen. How would Apple tackle the problem of music discovery if it entered today's ecosystem without its tremendous foothold? Given Apple's market position, it could have evolved the iTunes Store into a far-fetched super product that sounds like a pipe dream. How about, for example, a Netflix-Spotify combo service, with the option to buy the stuff like new TV that studios won't give up right away? Maybe that can't be profitable, but at the very least, what about any evolution that takes into account the way our listening habits are changing. Today, Apple's still the biggest thing in music, but its days of being what's next are in the past. And that's never sounded more crystal clear than with iTunes Radio.